Do you remember high school? I know, I try not to think about it, too. But, think back with me for a moment. Do you remember dealing with your locker? Lockers where great, except when they weren’t. The second time I tried, however, when it still didn’t open, something in my brain told me I needed to teach the locker a lesson (you have no right to thwart me! )… so I violently banged on it. Funny, that never seemed to persuade the combo lock to cooperate. Marketing your product or service to generate leads and sales can be viewed like a combination lock. If you only have some of the elements right, or if you have all the elements right—but not in the right order, the results can be very frustrating. However, if the elements are on the mark and combined properly, it works like a charm! … the result is a lead that can ultimately become a sale. In this article, I want to focus on the third element of the equation – getting your message to the right people. Assuming you know exactly who your target audience is, what are the most effective ways to deliver your message to them? I would like to highlight what I believe are the three best places to find the perfect audience for a B2B marketing message. LinkedIn is one of the premier fishing spots for B2B prospects. In the first quarter of 2018, LinkedIn had 562 million members in 200 countries. That is a pretty awesome fishing hole. On LinkedIn, you can get your message in front of exactly the right people. Need to showcase your content to Chief Information Security Officers (CISO) who are in banks with 100 or fewer employees in North/South Carolina? No problem. Since you have “the right people” targeted, you can also experiment with finding “the right message” that resonates best with them. There are two messaging dimensions you can test. Value Propositions: If you are targeting prospects later in the buyer’s journey (in the consideration or decision stages), you might want to find out what is most attractive to them at these stages. You can write different ads highlighting different benefits and see which one gets clicked on most often. Is it a warranty for your software? Or a free trial? Or integration with certain other platforms? Why assume or guess when you can know for sure? Topics: If you are targeting prospects earlier in the buyer’s journey, what topics are they most interested in? Why expend the time and effort to create content you think will attract your prospect, only to discover later it is falling flat? Again, don't bother making guesses when you can know for sure! This is a collection of over 2 million websites that reach approximately 90% of internet users worldwide. Although this platform is better for reaching B2C audiences, it can still be used effectively in the B2B context. Let Google find them: Using keywords you supply that your prospect might find relevant, Google shows your ad on websites relevant to those keywords. For example, if you offer a particular type of certification for HR executives, Google will show your ads on those websites (or specific website pages) that have to do with Human Resources (or things of interest to HR personnel). One easy way to start the process of getting the right keywords is to put your website, as well as competitor websites, into the Google keyword planner. Google will then come up with dozens of keywords that it thinks the websites are about. You can also utilize Google to build a custom affinity audience using website and page URLs. Google will then compile an audience based on who visits the pages you specify. For example, a running shoe company may want to reach avid marathon runners. They would compile website URLs that specialize in content about marathon running, training schedules, marathon nutrition, and other marathon themes. Google would then serve ads to people who visit these sites. Using this approach, it is possible to have your ad served to some of the people who may have visited your competitor’s website, but didn’t know you existed. Target them yourself: This is where you do your own research and find websites serving Google ads that your target audience would likely visit. In my opinion, this is the best approach to take (at least initially). Why? Because Google sometimes guesses at what it thinks are relevant websites for your target audience, but are actually way off base. For example, Google has served my ads, supposedly for certain executive training, to nursing websites that included the dimension of continuing professional nursing education. Heck, they even showed these ads on a bunch of mixed martial arts websites. Why? I have no idea. Both approaches on the Google Display Network require a daily review and weeding out of irrelevant websites. At some point, you will have only relevant websites… but it takes time and effort to reach that point. This final platform is where your prospects go to find information, or a solution to solve a problem. Rather than going to find them, you let them find you using the right keywords. Early stages (gathering information): You can identify broader educational search phrases of interest to your prospect and target those terms. Then, your ad can offer a lead generation special report that your prospects might find informative at that stage in their journey. For instance, you might want to reach people in technology sales by offering a white paper on technology sales strategy ideas. Then, you can follow up with them by offering them additional valuable information on technology sales. All the while, you are building a trusted advisory relationship with them. At some point, they will be further along in the buyer’s journey and ready to talk about your product/services. Later stages (consideration/decision): You will need to adjust your keywords to terms that are more representative of what is used to find a third-party solution or vendor (rather than just educational content). Using the example above, rather than bidding on the broader phrase “technology sales strategy,” you will target “technology sales consultants” or “technology sales consulting services” since your prospect is trying to find companies like yours. In both cases, you are attracting specific people who are interested in the topics and services with which your company has expertise. There are other ways you can target your ideal prospect. It just requires you to step into your prospects' shoes and think about where you might hang out or go to dig up pertinent information for your job or business. Your turn! Where have you found to be good places to reach your best prospects? 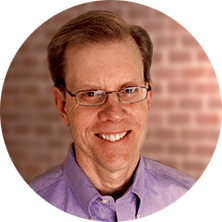 Patrick McDaniel is PMG’s Paid Search and Social Strategist. He likes figuring out how people work – in between facts and figures on organic search rankings, lead gen and engagement techniques, you’ll find hints of psychology and buying behavior in his writing. He loves helping readers understand how to reach and connect with their best prospects!